This project was created on 09/14/2018 and last updated 5 months ago. 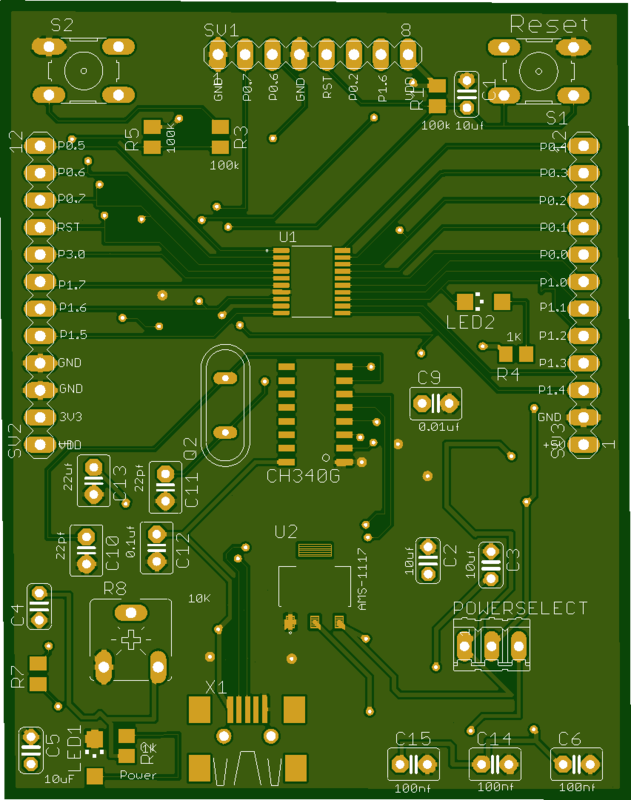 This project aims to build a development board for NUVOTON-N76E003AT20 microcontroller. The N76E003 is an embedded flash type, 8-bit high performance 1T 8051-based microcontroller. The instruction set is fully compatible with the standard 80C51 and performance enhanced. The development board features N76E003AT20 microcontroller , type B mini USB port, a USB to UART converter, voltage regulator, LED, switch , potentiometer for ADC input and general purpose IO ports for user applications. The N76E003 provides rich peripherals including up to 18 general purpose I/O, two 16-bit Timers/Counters 0/1, one 16-bit Timer2 with three-channel input capture module, one Watchdog Timer (WDT), one Self Wake-up Timer (WKT), one 16-bit auto-reload Timer-3 for general purpose or baud rate generator, one SPI, one I2C, five enhanced PWM output channels, eight-channel shared pin interrupt for all I/O, and one 12-bit ADC. The peripherals are equipped with 18 sources with 4-level-priority interrupts capability. The N76E003 contains an up to 18K Bytes of the main Flash called APROM, in which the contents of the User Code resides. To facilitate programming and verification, the Flash allows being programmed and read electronically by parallel Writer or In-Circuit-Programming (ICP). Once the code is confirmed, the user can lock the code for security. We used KEIL-C51 IDE to programming. We had used NUVOTON based In-Circuit-Programming (ICP) software to flash the code in the controller. We checked the working of the board by running different types of code like GPIO, External Interrupt, Timer, LCD Interfacing, ADC by interfacing temperature sensor on the board. This is the main schematic which we had design for N76E003AT20 Development Board. 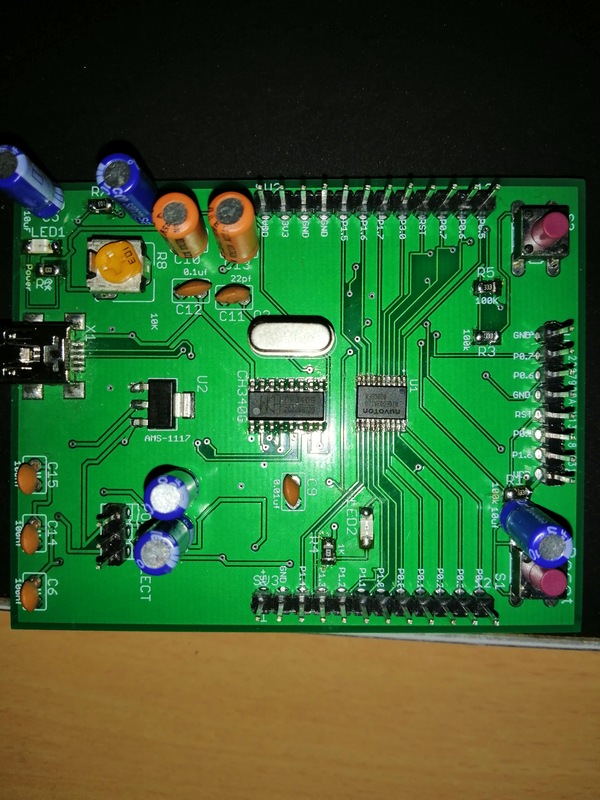 We scholder all the components on the pcb and checked the working of the development board using different codes. 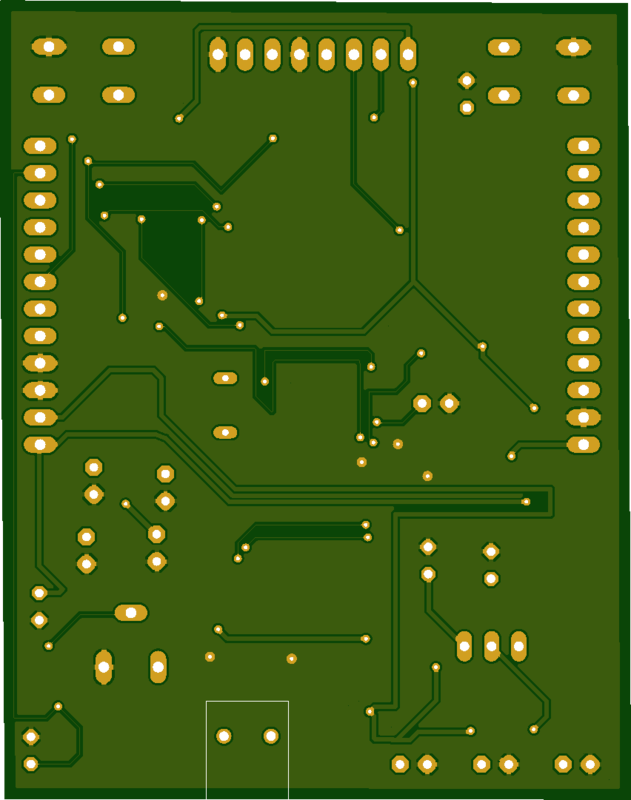 We got the designed pcb for further scholdering of component on it. We had designed Layout for our development board using AUTODESK EAGLE CAD Tool. We had designed schematic of the development board by using AutoDesk EAGLE CAD Tool. we had taken different type of peripherals in Schematic which we want to use in our board, for design this schematic we had used AutoDesk EAGLE CAD Tool. The design is made taken into consideration of the different requirements of the ICs used in the board. After design layout it checked layer by layer in gerbview software and then it is given for the fabrication. After the PCB is received, the components are soldered in the main PCB and are checked for any short connections. You are about to report the project "Board development for NUVOTON-N76E003", please tell us the reason.